Are you ready to take a break and relax? Then take a side trip to Moose Point State Park. This is a great place to get away from the more populated areas. Here you can enjoy an evergreen grove, check out the tidal pools and/or take a peaceful walk on one of the Park's trails. 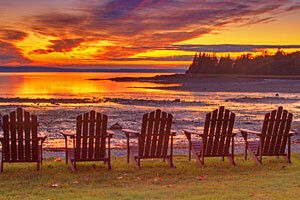 On the other hand, if you prefer, just kick back and enjoy the views of picturesque Penobscot Bay. Not considered a destination location for the typical traveler, Moose Point State Park is, however, a great place to take a break from the road and relax for a while. Here you will find clean restrooms and convenient picnic tables located near the small parking lot. Bikes are not allowed on the trails within the Park, but you can travel to the Park by bike on the bike lane adjacent to US Route 1. The Park has a bike rack at the parking lot. Moose Point State Park is 183 acres of land nestled next to Penobscot Bay and an excellent spot for picnicking, sight seeing, and just relaxing.